I’ve always wanted to do it. I’ve always wanted to visit every subway and SRT station here in Toronto. But I kept putting it off. It’s like a private club to which surprisingly few of us belong—sure, you may have passed through all the stations, but have you been to each one? The Toronto Transit Commission (a.k.a. ‘the TTC’) is woven inextricably into our daily lives. It binds and connects us. As residents of the city, we have a symbiotic relationship with the subway—even if you drive a car and never set foot underground, we’ve all seen the ripple effect on traffic, when any part of the system isn’t working, or gets delayed. Despite its challenges, I want to celebrate our rapid transit network, and in particular, the variegated built-form of its station facilities, within the context of the surrounding urban fabric. Nevermind the politics, the crowding, or the delays—stations are a physical expression of civic intent. Judging the success or failure of this expression demands a first-person, reflective visit. A brief personal contemplation. I’ll record subjective moments, and my casual ruminations along the way. 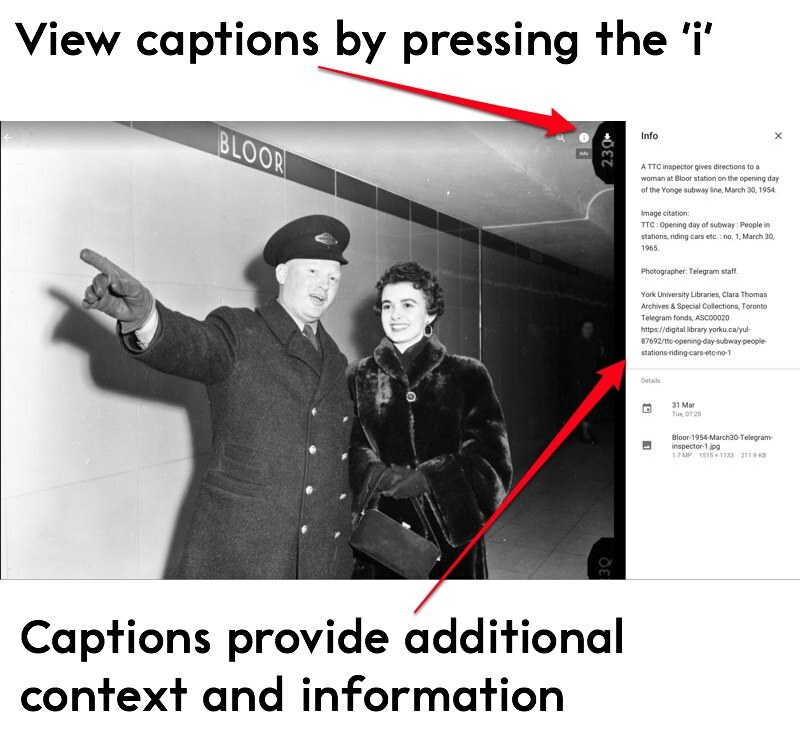 A captioned photo gallery. I’ve tried to capture the physical sense of every stop, and to document the context of every image. A corresponding collection (located at the end of each gallery) of archival news articles, sourced images and historical photographs, many of which have not previously been aggregated or even available online. These glimpses of the past provide valuable insight into design intent and original station appearance. 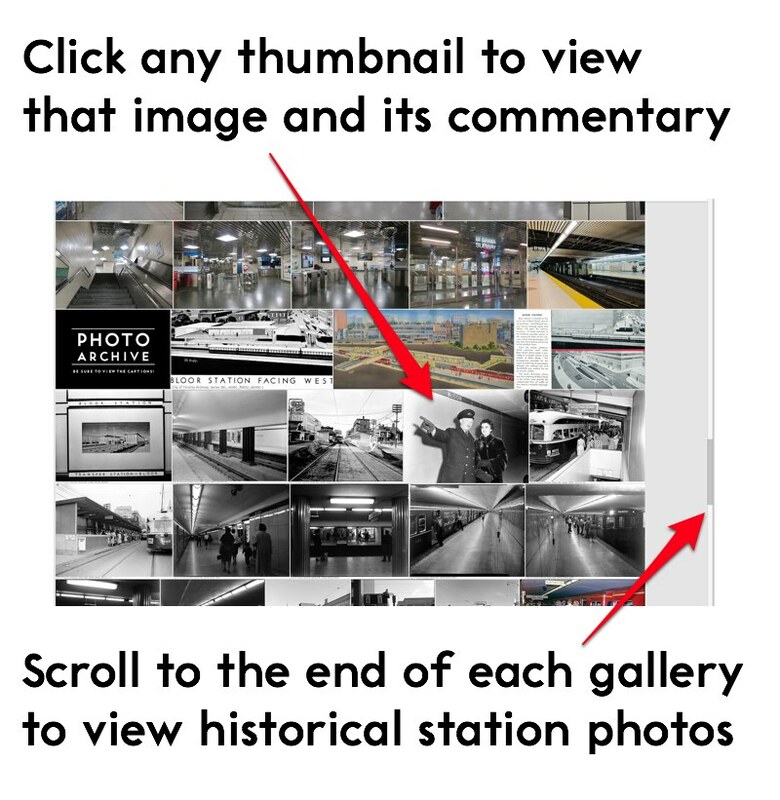 At the end of each station post, you’ll find a link to a gallery of photographs for that station. The 5,000+ photographs and 2,000+ historical images assembled for this ambitious online project represent a major, independent, systematic visual review of the entire TTC station system, as it existed in the second half of 2014 and in 2015. Love them or hate them—these spaces are our shared public heritage. Come explore them with me! See also: Thanks and Acknowledgements / Want to help? p.s. Have you got a TTC station story to tell? Share it in the comments! I’m only going to officially visit one primary station for any given calendar day; the idea being I owe each stop my full attention and curiosity. i.e. No stopping at ten stations in 5 hours and being finished in a week. Where I’ve missed a salient image or feature, or am unsatisfied with my results, I’ll return (e.g. the escalator at York Mills was under renovation during my main visit, so I went again when it re-opened). Some galleries are composited from multiple trips due to complexity, or encounters with ornery station employees. where possible, I’ve included relevant archival photographs primarily sourced from the City of Toronto Archives as well as the occasional news article from the Globe or the Star. The end result will be an informal, but extensive reference guide to station identity. To mark each visit (and ‘prove’ that I was there), I’ll take a transfer as a souvenir. Expect to glean a decent idea of ‘what the station looked like, in 2014/15’. You may find my predilection for shooting certain mundane details and views peculiar and repetitive—do we really need so many stairwell photographs?—but the goal here isn’t to take great photos: it’s to review and reflect on what’s there. Moreover, some stations are obviously more photogenic, or of personal interest, than others. You have been warned! Start: Welcome to my journey!